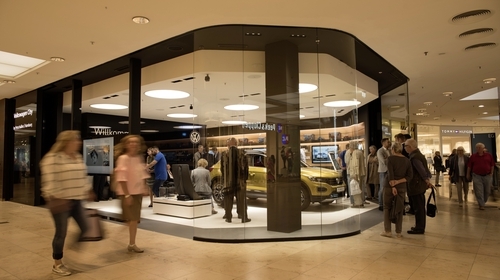 Pop up car showrooms and online sales are the way forward for Volkswagen and other car companies. Volkswagen has become the first company to comprehensively outline how it will sell you a car in the future - online sales and sales that don't involve a dealer are all promised from 2020. Direct sales that do not involve dealers, more city showrooms, pop-up stores and a massive expansion of online sales are all promised in the new plan announced this week by Volkswagen. It's not the only car company re-shaping its future in the digital age and it is not the only company that realises conventional car ownership, the way we utilise cars and the way we buy them (if we buy them in the future) are changing rapidly. For example, Ford and Nissan are already planning for the day when they provide vehicles for people to use as and when they want, without them actually owning one - becoming a global car hire company, if you will. Reuters reports the new sales model will be ready in time for its electric "ID" family which will debut in 2020. Rival electric carmakers like Tesla already offer direct online sales and over-the-air updates. From 2020, Volkswagen customers will have a personal ID number and be at the centre of "a fully-networked world of mobility including seamless individual support going beyond vehicle purchasing, with round-the-clock availability", so no having to visit a dealer only when it suits them. Volkswagen plans to build 10 million electric cars based on its new modular MEB platform and is aiming for the launch of worldwide mass production toward the end of 2022. New digital distribution channels will help push vehicle sales. "Volkswagen will develop a joint Internet platform which will handle the entire purchasing process through to contract conclusion, including financing, payment and even used car trade-ins," the company said, adding the new sales outlet would work in partnership with its existing dealer organization. Jurgen Stackmann (right), a member of the Volkswagen board, says each VW customer will have an individual ID number to ensure their specific needs are met.
" We will learn more about our customers’ needs and will be able to develop optimum tailor-made offerings for each individual customer through intelligent data management. This is already practised successfully in other sectors," says Jurgan Stackmann, a member of the BW board who is in charge of sales. He says customers will benefit from a wide variety of tailor-made offerings. "For example, vehicles will be kept up-to-date by over-the-air software updates via the mobile phone network. Vehicles will notify the dealer that the next service is due via the predictive maintenance app. There will also be services going beyond customers’ own vehicles such as We Share – the planned car sharing offering from Volkswagen. Stackmann has pretty much signalled the end of car dealerships as we know them. This is what tomorrow's will look like. "On-line business will make a key contribution to the development of the new sales model and is currently being massively expanded. Within the framework of its new digital partnership with its dealers, Volkswagen will develop a joint Internet platform which will handle the entire purchasing process through to contract conclusion, including financing, payment and even used car trade-ins", Stackmann says. Customers will be able to choose from the entire brand model range and to complete their car purchase with their selected dealer online. For Volkswagen, the new platform will offer the possibility of direct sales for the first time; the brand intends to use this possibility mainly in the fields of software and on-line services. People who prefer to maintain personal contact with the brand and the dealer will have a choice of different points of contact in the future.